Yesterday I got some bentonite clay in the post from ebay. 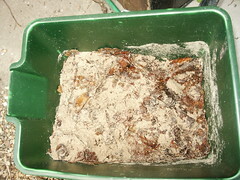 So in the evening I started sorting out the sand that I rescued from the preschool sandpit. As you can see it’s full of bark chips, twigs and leaves. I gradually sieved it through a garden sieve and then a kitchen sieve (bought for the purpose). Now, through Yahoo groups I’ve found that it might be the wrong sort of sand as it’s not sharp sand. But on the plus side I’ve found there is a foundry in my local area that sounds all arty and interesting so I’ll give them a ring later and see if I can scrounge some sand and hopefully advice as well!